I recently tried creating a Maven core integration test using the archetype that the team kindly created. However when I tried to use it I got Unable to find resource 'org.apache.maven.its:maven-it-sample-archetype:jar:1.0-SNAPSHOT'. Turns out this artifact does not live in http://people.apache.org/repo/m2-snapshot-repository - instead I've learned that Apache has new Maven repositories set up now that projects there are slowly adopting. Anyways I added a proxy for https://repository.apache.org/content/groups/snapshots-group/ to my local Nexus install. 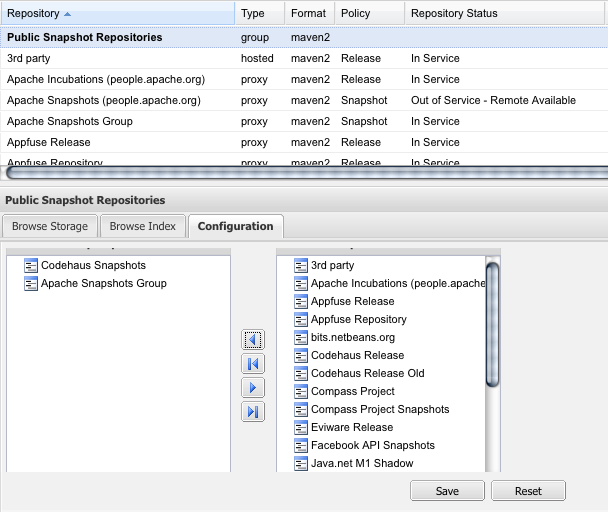 Then I disabled my old proxy for http://people.apache.org/repo/m2-snapshot-repository since the snapshots-group includes the PAO repo. Finally I added the new repo to my 'All Repositories' and 'Public Snapshot Repositories' group in Nexus so that my Maven build will pick it up. Here is some information I found out about the new repos. The new Apache.org artifact repositories - use em' or else.